Did you know that Lo Stagnone offers more than can be seen on the first sight from the beach? Here is our pick of 5 favorite spots, brought to you by local kite center ProKite Alby Rondina. On the top of our favorite spots list is without any doubt the salina wall at the west side of the lagoon, next to Isola Grande. While it takes some effort to arrive there, reward is unbeatable flat water, created by old salina wall with no obstruction upwind, so the wind is very steady. Water is extremely flat and deep enough to pull out the tricks, but it is advised to take caution because in any unfortunate event of accident or equipment damage you are quite far from the beach. Best to always travel there together with few friends and support each other. Best conditions to get and kite there are north-west wind, since it is easier to kite upwind there and wind is 90 degrees to salina wall, so you can cruise along its flat water. We used the spot to shoot 2017 Cabrinha kites with James and Alby earlier this year. This is not really a “spot” in a common sense, more like a sight to visit during your kite session. On the south-west part of the lagoon lies a very small and charming island called La Scuola, it contains very small marina and few ruins of the houses. While purpose of the houses remains a mystery for us, since there is literally nothing to do at the island, it is very interesting and beautiful place to see. Downwind side of the island has also small part of flat water that you can use for takeoff your tricks, but beware couple of rocks that are around the island. This place is where magic happen. Seriously, if you want to experience one in a lifetime mirror flat water conditions, you have to visit north side of the lagoon during north-wind. Water gets shallower and gee grass touch the water level, creating really mirror water, you can kite on! In may look like it is hard to kite there, but opposite is the truth! It is super easy to ride upwind and experience from cruising the butter flat is sheer pleasure. We advise to take short or no fins, and if your kite crash first stand up and shake the sea grass from the lines prior to relaunch. Have fun! San Theodoro is popular beach for tourists, because it azure Caribbean looking water and white sand on the beach. 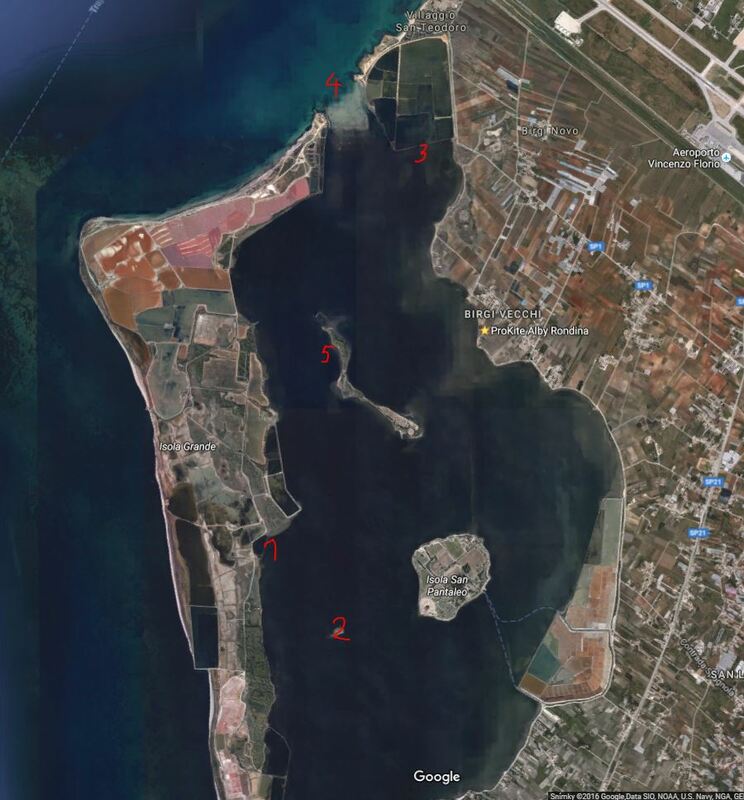 It is not easy to kite there and there is also no place to start / land the kites, so the best way is to kite upwind from the lagoon and cross the channel on foot. Water and surrounding is really beautiful so it is definitely worth a trip. When the south wind is prevailing, Salinas on Isola Grande create perfect flat water in sea side of the spot. But you have to take care not to be drifted on the open sea! While kite spot in front of the kite school can get pretty crowded during the windy days, very few kiters venture behind the island of Santa Maria. It is surprisingly very easy trip with any wind direction (cross it from the upwind side) and on the other side you can find perfect conditions, empty space and beautiful nature. We shot pictures and video of slider project with James Boulding at this spot, since we was not interrupted by random kiters. Als a memorable experience is to make a round around the island, but plan it during the day of stronger wind, so you can relay that it will not die on you. Also keep distance from the island when you will pass it from the downwind side, since wind is down close to it and you may end up with your kite in the water. Hope you will have fun at any of these spots!